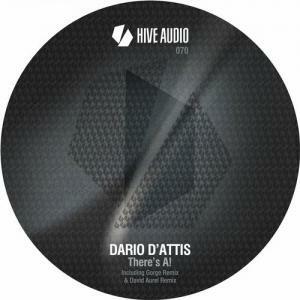 Active on the release circuit for about 15 years now with a string of numerous singles released on labels like Nervous Records, Purple Music, Poker Flat Recordings and of course Hive Audio we're glad to see our good friend Dario D'Attis coming back with a new banger in 2k17. Repeatedly proclaiming that "There's A!" going on over a well energetic foundation of super solid, functional TechHouse sporting a slightly, yet constantly filtered and dubbed out motif Dario D'Attis' original tune is making a clear, incorruptible statement that surely applies to each and every vibing dancefloor throughout and way beyond the next months. Status: future classic. The first remix on this single release is provided by Mannheim's Gorge whose rework is exploring a more playful and uplifting path musically whilst speeding things up and encouring the crowd to raise their hands in the air through the use of ecstatic breakdowns and some sweet'n'jacking, interlaced and well acidic ornaments. Finally "There's A!" is reworked by the Switzerland-based producer David Aurel who has released quite a few singles alongside his friend and studio partner in crime Dario D'Attis in the past. His take on the original tune keeps up with the general TechHouse vibe of the tune whilst stripping things down a bit and providing a techier, sharp-edged feel perfectly rolling along with the tunes' seductive bassline grooves.